Are you looking for a great treat for trick-or-treaters, but don't want to give out junky and unnatural candy? 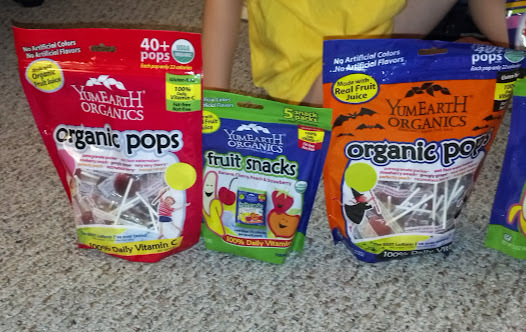 Pick up a bag of YumEarth's Organic Halloween Lollipops! These lollipops are available in many stores! I've seen them at my local Home Goods and Wegmans. In addition, these suckers are organic, natural, and GMO-free. They are extremely tasty and juicy--kids love them! YumEarth lollipops are a great treat for kids with allergies to dairy. In addition, these suckers are gluten free! The pops are also peanut-free, tree-nut-free, fat-free, egg-free, shellfish-free, soy-free, wheat-free, vegan, kosher, and contain no artificial colors or flavors! We gave out the Halloween YumEarth suckers at two different trunk-or-treat events this year, and they were gone in moments! The kids were excited about a yummy, colorful treat, and the parents were excited about an organic treat. The bag is decorated for Halloween and zips closed, so you can just pass out candies directly from the festive bag, if you like! They're easy to take on the go because of the resealable bag.